My whole family loved this hearty Chicken and Vegetable Soup. It is grain free and dairy free, which means it’s Paleo friendly. Leftovers freeze really well, and also heat-up for lunches at the office. Each 2 cup serving is under 300 calories, and has 25 grams of protein! When my daughters were younger, I didn’t serve soup very much. Even though I am a huge fan of soup for dinner, they never seemed to eat much of it. So I didn’t rotate it onto the menu often. Everything changed for soup in our house about a year ago, when I took the girls to Disney World. During their school break, I schlepped them down there by myself and Jason stayed back in Vermont. We had a ball even though the parks were much more crowded than usual. We kept our itinerary loose and when in doubt we went back to the pool at our hotel. We had the dining plan and we ate some really memorable meals. It was during that trip that I discovered my younger daughter (age 9 at the time) had suddenly turned into a full-fledged chicken soup fanatic. Everywhere we went she ordered chicken soup. On one hand I was thrilled, because I love soup and I had always wanted to serve it more often. On the other hand, I was torn because with our dining plan she could have ordered something much more expensive! But you know how it is trying to get kids to eat something they don’t want to. #dontbother All she wanted was chicken soup. Meal after meal!! So upon our return I made it a point to make soup as often as I wanted, and I was so happy the kids happily lapped up their bowls and asked for seconds! 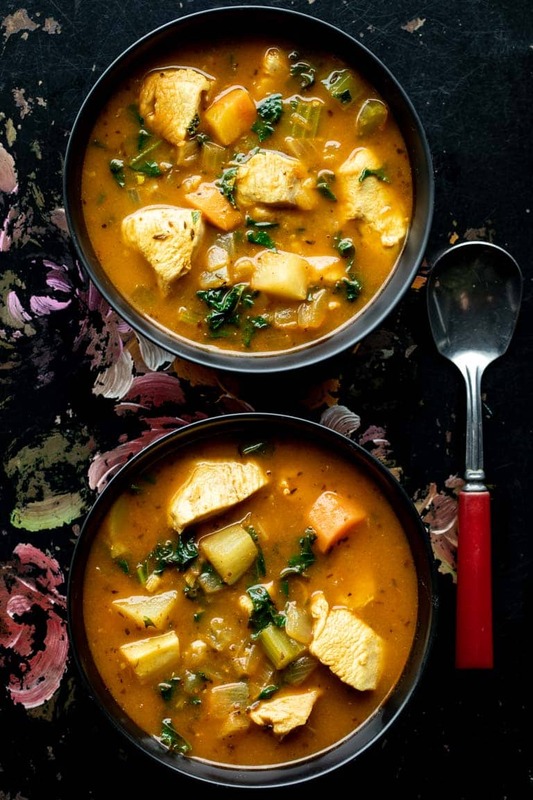 This winter we have been loving variations of the Paleo Chicken and Vegetable Soup. Since our paleo challenge in January, I have made it several times. It is ultra hearty because it is loaded with tons of paleo-friendly root veggies (parsnips, celeriac, turnips, carrots etc.) and the broth has tons of flavor due to the spices. 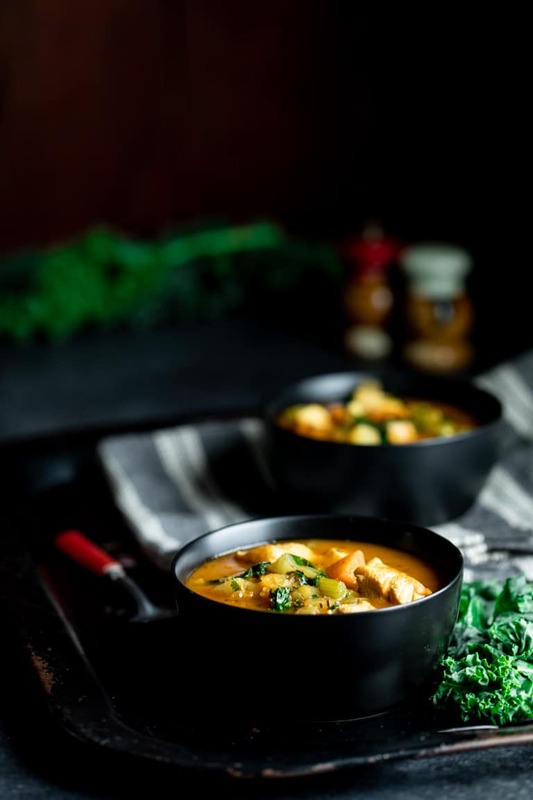 To get the most flavor from the boneless-skinless chicken breast, searing it in the soup pot first is such a great way of bumping up the rich chicken flavor. Just make sure to let it sit undisturbed until it is browned on the bottom, then stir it. Otherwise it will stick to the soup pot. Those tasty crusty bits on the bottom of the pot (fond) will add a ton of flavor to the overall soup. Chicken breast can really dry out quickly because it doesn’t have any fat. So the key to using chicken breast in a soup recipe is to only cook it until it is done. Don’t simmer it and simmer it until it is tough and dry. So what I do here in this chicken soup is I do the initial sear step, then remove the chicken breast with a spoon and set it aside on a plate. Then it goes back into the soup at the end once the vegetables are nice and tender. After the chicken is cooked, cook the onions, carrots and garlic. Cooking them in oil will allow them to brown a bit, because they are high in natural sugars. Sizzling the garlic in the oil also really helps to mellow the flavor of the garlic. The browning of the onions and carrots adds a rich depth of flavor and sweet balance to the soup. Before adding in the broth, add the spices in and let them bloom in the oil. I used paprika, thyme, sage and turmeric. Plus salt and pepper of course! I really love ground sage, but it can be harder to find, so I called for dried sage (often labeled as rubbed.) If you’re subbing in ground sage, just use 1/2 teaspoon as it is much stronger than (fluffier) rubbed sage. The key to making chicken soup without rice or grains is to add plenty of other hearty veggies to make it satisfying enough for a complete meal. This is a great opportunity to work some underappreciated root vegetables into your family’s diet. I used parsnips and turnips in addition to the celery, onion and carrots. But rutabaga or celeriac would also be delicious in this soup. I have been avoiding tomatoes while experimenting and working toward getting to the bottom of my GI issues, so I have not tried them in this soup. But normally I would have added a 14-ounce can of whole peeled tomatoes, crushed by hand. I love the chunky texture of tomatoes in a hearty soup like this, and the acidity of the tomatoes would really pair well with the root vegetables. I added fresh kale leaves to the soup. I did so at the very end and only cooked it just until it is tender (it took about 5 minutes.) If you’re making this ahead and reheating, you don’t even really need to do more than just bring the soup up to a simmer before shutting it off. The kale will soften when you reheat it later. Same goes for making this as a freezer meal. To freeze this soup, transfer it to 2 cup containers and let it cool. Then cover it, label it and freeze it up to 4 months. Defrost it in the refrigerator and reheat thoroughly. I think this recipe is hearty enough to stand alone as a one pot meal, but if you want to serve it with something, try these gluten-free savory muffins or this gluten-free skillet cornbread. For a paleo friendly side dish you could serve this with a salad like this chopped winter salad. If you want to make this soup for meal prep, you can either make it up to 4 days ahead and reheat. Or you can chop all the veggies ahead. Think of it like creating a soup kit. Cut and measure the veggies and store them according to when they’re added to the recipe. So, put garlic, carrots and onions in one bag or container and then the parsnips, celery and turnips in another. Kale can even be prepped ahead as well. Feel free to measure your spices into a small jar or tupperware too. It will make this recipe even faster! Thanks so much for reading. If you make this recipe, please come back and let me know by leaving a star rating and review! It means so much! Heat 2 tablespoons oil in a large heavy-bottom soup pot over high heat until shimmering, but not smoking. Add chicken in a single layer and let cook, undisturbed until it is browned on the bottom, about 4 minutes. Stir and continue cooking, stirring once or twice until the chicken is opaque all the way through, 3 to 5 minutes longer. (Test by cutting a piece in half.) Remove the chicken and any accumulated juices to a plate. Cover with foil to keep warm. Return the soup pot to medium heat. Add the remaining 2 tablespoons oil and allow to heat until hot, but not smoking. Add garlic, onion, carrot and salt and cook, stirring often until the vegetables are softened and starting to brown, 8 to 10 minutes. Add paprika, sage, thyme, pepper and turmeric, and continue cooking, stirring constantly until the spices are fragrant, 90 seconds to 2 minutes. Add broth, celery, parsnips and turnips, cover and bring to a gentle boil over high heat. Remove lid, reduce heat to medium-low or to maintain a simmer, and cook until the vegetables are tender, about 15 minutes. Break up tomatoes if using with your hands into large chunks. Add them and any juices from the can to the soup. Stir in the cooked chicken and any juices from the plate, and kale. Cook until the kale is tender, about 5 minutes. Serve hot drizzled with additional extra-virgin olive oil if desired. Next Post Is a Cleanse Diet Right for Me?